Red Pine luxury condos at The Canyons are just steps from the Gondola! This 2 bedroom plus loft townhome at the Canyons offers every creature comfort available for a year round getaway at the Canyons Resort in Park City. 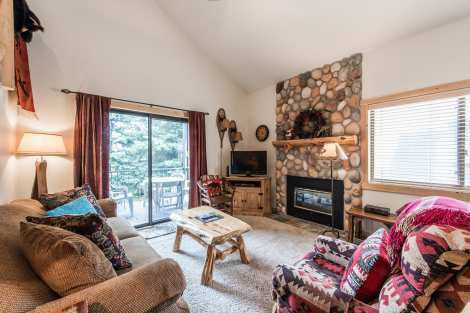 Just steps to the ski slopes and Gondola, Red Pine offers private residences right at the foot of mountain adventure. Whether you are skiing, hiking, biking, golfing or swimming, Red Pine is an ideal location for your next getaway to Park City. This private townhome offers a spacious kitchen and living area with ambient fireplace and abundant mountain views. Three bedroom spaces are offered; a king suite, an upstairs bunk suite with 4 twin beds and a loft space with a queen. In addition, the main level offers a queen sleeper sofa. The diverse accommodation sleeping 10, allows for the enjoyment of various travel group dynamics and the common area amenities make this location even more spectacular. Two common area swimming pools, an indoor and outdoor hot tub, a sauna, volleyball courts and tennis courts, provide plenty of additional amenities for summer travelers. The new Canyons golf course is adjacent to the property and the base lodge area offers shopping and dining year round, just a walk away! Book your next trip to Park City at Red Pine and take advantage of all this townhome has to offer. The condo was nice and clean good location, the check in process was a bit stressful as we arrived after their closing time and could not reach anyone. But in the end it all worked out, I would suggest having an emergency or after hours number available for instructions. Overall it was a good experience loved the grill and the pool. No AC, the Loft is way to hot to stay in the Summer without air conditioning. There were also a couple lights that were burned out. Other than that the stay was amazing. Close to Park City downtown and the shopping centers.